We recommend that clients implement their inventory and/or work-in-process tracking systems incrementally. A popular place to start is in receiving. For simpler receiving operations, the BellHawk software can simply record the receipt of each item. Here the material handler records the item, the supplier, the quantity, and, if appropriate, the lot number and the expiration date. The material handler can also use weighing scales to automatically weigh the incoming item and can use a barcode printer to print out a label with a tracking barcode for each container or item received. For more complex situations, purchase orders (POs) can be entered into BellHawk directly or imported from another system. Then the items can be received against the PO lines, so as to reduce data entry and ensure accuracy. Typically receiving is done using a PC equipped with a barcode scanner and printer, as well as a weighing scale. Receiving can also be performed using mobile computers when large items are being received or receiving is being done outdoors. Once materials have been checked in then they are put away. Typically the locations where the received material are put-away are recorded by scanning location barcodes on racks or floor stands. This enables the materials to be readily located and used in FIFO order. It also enables cycle counting to be quickly performed using mobile computers. The receiving process can be simplified if your supplier applies a tracking barcode to each container and then electronically sends an advanced shipment notice (ASN) to you using EDI software. This ASN data can be imported from the EDI system and stored in the tracking database until the pallets or other containers are received. At this point, the tracking barcode on each pallet is scanned and the ASN data is matched with the container, to complete the receipt with a single scan. 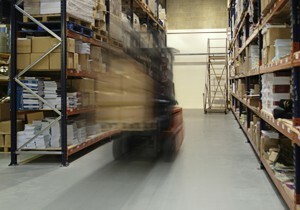 This can result in significant time savings as well as increased accuracy in receiving. Once items have been received then the receipts can be automatically exported to an accounting or ERP system, where they become accounts payable to suppliers and also increase the inventory being tracked in the financial system. BellHawk can handle the receiving of customer owned materials. Here, users can substitute the use of an Advanced Shipment Notice (ASN) for a Purchase Order and use a uniform receiving process for both purchased and customer owned material. Also receipts of customer owned material are not exported to accounting or ERP systems as accounts payable, nor do they increase inventory value. BellHawk can also track the receipt of vendor managed inventory (VMI) and track it as supplier owned material until it is withdrawn from VMI inventory. At this point, it becomes owned by the company and appropriate accounts payable and inventory value records can be automatically exported to an ERP or accounting system. Also an alert can be sent electronically to the VMI supplier when replenishment is required.